A week after the TPLF (EPRDF) led Ethiopian regime declared a State of Emergency across Ethiopia, few days after the specifics of it such as banning any form of anti-gov’t protest, were made public, the Gonder city, Northern Ethiopia has launched a general strike against the government today. There have been three general/stay away strikes against the regime so far in Gonder city. The general strike includes the closures of all private businesses and services including transportation. The city streets remain deserted and government employees are affected due to the protest forcing the closure of government services as a result. Gonder city has one of the largest and oldest universities in Ethiopia enrolling students from across the country. In addition, large investments such as Dashen Brewery and Amhara region’s main offices are located in the city of Gonder. The historical city of Gonder also attracts many tourists every year, which has decreased by 70 percent since the beginning of the protests in July, according to Amhara region’s television. The stay away protest will stay on until the end of the week. Last week Bahir Dar, the capital city of the Amhara region, held a successful stay away strike for five days. Under the six month long State of Emergency, the Command Post, which is now ruling the country, can take any measure against businesses closing their businesses as a form of protest or anyone taking part in any anti-government protest. 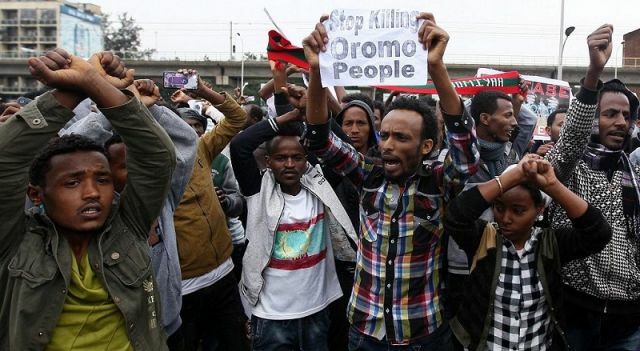 The curfews and the declaration of the SoE does not seem to have worked in Ethiopia as the protests have spread and increased in momentum especially in the Amhara regional state. Later in the day, some shops have been opening and transport started operating due to pressure by the government.